We would like to congratulate Beth Watson, CFRE of the Sisters of Mercy – Northeast Community on receiving her CFRE Certification in 2018. National Philanthropy Day - Thank You! Thank you to all who made National Philanthropy Day 2018 a huge success, especially our sponsors! Join us for the AFP-RI Holiday Networking Breakfast on December 7, 2018 at the Gamm Theatre. Take advantage of a wonderful chance to network with your peers before year's end, and a chance to win great raffle prizes! The AFP Foundation for Philanthropy is pleased to offer the Diverse Communities Scholarship program for members of diverse communities to attend the AFP International Fundraising Conference San Antonio, TX, March 31 - April 2, 2019. AFP is pleased to offer $1,500 scholarships ($799 conference registration fee + some travel expenses) for each of the currently identified AFP diverse communities. THANK YOU to everyone who contributed to the diversity scholarship campaign, for your generosity and for helping to ensure the success of this program. AFP’s diverse communities include: African-American/Black, Asian, People with Disabilities, Faith-based, LGBTQ, Hispanic, Jewish, Rural, or another underrepresented community. The application process will open September 1 – October 31, 2018. Deadline for application submission is October 31, 2018. Selected candidates will be notified by email by December 1, 2018. This scholarship opportunity is open to members and nonmembers and we encourage you to distribute to the colleagues in your personal and professional networks. If you’ve been considering submitting a Certified Fund Raising Executive (CFRE) application, now is the time to put yours together! Submit your application by the July 15 deadline to get one step closer to becoming a CFRE. Once your application is approved, you’ll be eligible to sit for the CFRE exam. Learn more here. On Tuesday, June 5th, AFP-RI and more than fifty other non-profit organizations all over Rhode Island are participating in the First Annual RI Gives Day. Through the grassroots participation of non-profits across Rhode Island, RI Gives Day is a day of RI philanthropy. Tell your friends, mark your calendar and join in the fun! As a friend and loyal supporter of AFP-RI, I know that you believe in the power of philanthropy. 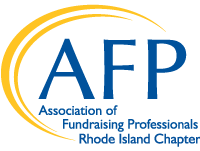 I hope that you will consider joining us on the first RI Gives Day, by making a gift to AFP Foundation’s Be the Cause campaign. There is currently a $50 off promotion coupon for new members in the professional and associate membership categories only. The online code to take advantage of this offer is AFP2018. This offer runs through June 30th.